Look out your window for a minute and see if you can find a bird. Do you think that bird stays in your neighborhood all year? Or does she migrate to some other place? Back in the winter of 2013-2014 people began noticing something wonderful and surprising. Snowy owls were showing up in parts of the United States where they were rarely seen. Why? What changed to make snowy owls fly so much farther south? A group of scientists began asking that question. They made a map of all the places where snowy owls had been sighted. If you look at the map, you can see if snowies came to your neck of the woods. Turns out there were more lemmings in the Arctic than usual and that meant there was more food for the snowies to eat. What happens when a snowy has extra food? Why were there more lemmings? What happens to make the lemming population extra large? Turns out there is quite a chain that has to be in place to make the perfect conditions for there to be an irruption in the snowy owl world. This is a wonderful exploration of our natural world with all of its bits and pieces and cause and effect. For those who are fascinated with how scientists solve problems, this is a firsthand exposure to some folks who had questions and used their creativity to figure out how to get answers. For those who love our natural world this is an exciting and beautiful adventure into the world behind the invisible wall that separates us from the wild. 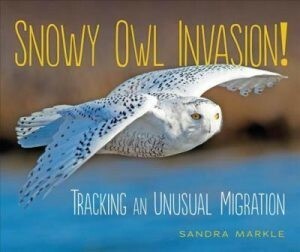 Great photos, engaging narrative, glossary, index, source material round out what we have come to expect from a book with Sandra Markle's name on the cover.